Joshua says this about this album: “As the title suggests – it’s again a more rhythmical, energetic album, and I had maximum fun doing this one. There are many soulful melodies on Indian instruments like bamboo flute, sitar, dilruba and santoor, flying over strong ethnic and modern grooves, hiphop, drum ‘n’ bass and trancey rhythms and sounds – all interwoven with Manish’s ‘pumping’ tablas. But there is one more thing. I got totally into singing! As wise English lyrics about love and life don’t come easily to me and ‘lalala’ felt a bit boring, I got into my own very contemporary version of Indian ‘Tarana’ singing and also chose some beautiful mantras. This album went through many different stages. First I did initial recordings in India, then I took the pieces on tour to play them live. Afterwards I recorded them in my private studio in Tuscany, Italy, and finally taking them to studios in Holland and Denmark. The main musicians I’m playing with are Manish Vyas, multi-instrumentalist from India; Maneesh de Moor, keyboardist from Amsterdam; and Rishi, drummer, producer and genius from Copenhagen. Of course there are also other musicians who left their juicy statements on the album, like Chintan and Dinesh from ‘Hamsafar’ and great talents from the Indian and Danish music scene. 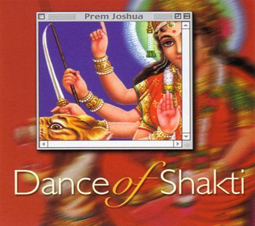 Shakti, Shiva’ s partner is a very lively and powerful goddess, and Prem Joshua, with his latest release, DANCE OF SHAKTI, has captured this flavor in the CD. Full of harmony – round, melodious and at times soft and feminine – the music is always full of juice and passion! Joshua has successfully combined old mantras and interwoven them with the Indian sounds of sitar and the melodies of the bamboo flute. And this music soon gets you going with the drive of the drum ‘n’ bass, electronic sounds, and electric guitars. This album is the meeting of the at-ease-ness of the East with the bubbling liveliness of the West. Joshua who lived in India for many years has learned a lot from his Indian musical masters. Now he brings back to the West his rich experience with Indian classical music. Here he lets Shakti ride the tiger of fast beats. No dreamy Indian sounds here, but fresh and fast combinations that shake you awake, and get you ready to take off on any dance floor or disco. Many of the tracks on DANCE OF SHAKTI invite ecstatic dancing and celebration. Pieces like “Himalaya Trance” or “Nanak” are a real treat lasting longer than 10 minutes positively inviting you to surrender with the trance of the mantras. Prem Joshua goes far beyond the old musical structures of the Occident and Orient. This could easily become the next trend in clubs and discos from London to Madrid and New York to Paris. As far as I know – this is already happening in Delhi and Bombay!